Farmersgirl Kitchen: How did you sleep last night? Last year, Silentnight Beds carried out research which showed that only 1/4 of all parents are getting a good night's sleep. I've been taking part in some research which is being carried out together with the Silentnight Beds Scotland office. I used to sleep like a log, but recently a combination of work, family demands, a snoring husband and being of 'a certain age', has meant that I tend to wake several times a night and by morning I am often feeling tense and exhausted. So I filled in a survey of my sleeping habits and waited in anticipation of some interesting 'sleep accessory'. Maybe it would be a special pillow, some sleep inducing tea, who knew? 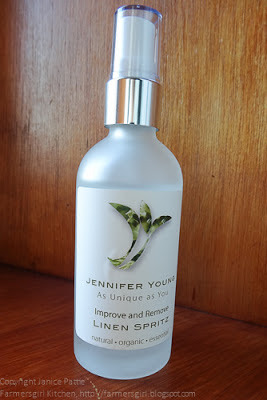 When this bottle of Linen Spritz by Jennifer Young arrived, I wondered where on earth it had come from. I receive a regular flow of products to review but I couldn't remember signing up to review a Linen Spritz, which I assumed was something to be used when ironing. As I thought more, it slowly dawned on me that this was my sleep accessory! I duly sprayed this mixture of witch hazel, rosemary and lavender on my sheets and pillow every night for a week, much to my husband's horror. However, the scent was not strong and it seemed to me that all it did was make my pillow damp. I can't say that it made any difference to my sleep, some nights I slept well and others I woke several times, just as normal. 1. Put off the television and the computer an hour before you go to bed. 2. Don't have a television in your bedroom. 3. Go to bed at the same time as your partner, so you don't wake each other up. 4. Get a blackout blind to keep the early morning light out of your bedroom in summer. I have no trouble with keeping to tips 2-4 but am guilty of staying on the computer far too late, so I should probably take my own advice and get off here for a good nights sleep! Labels: lavender, linen spritz, Rosemary, Silentnight beds, sleep, witch hazel. I recently pigged out on a large bar or chocolate covered marzipan and had the best nights sleep ever. I have heard that almonds are meant to help you sleep but I just fear that my thighs might not thank me for this cure in the long term. I also have to sleep with ear plugs in every night. The very best ones I've found are Quies but they are not cheap so I'm making do with some foam ones at the moment and a cuddly sheep pressed to my ear to drown out the snoring as best I can! I can't sleep with any light of noise polutionn so I do find it difficult to get to sleep quite often. I have a lavender spray and I feel that it does help. Not strong scent but very pleasant. Camilla - love the almond idea, I've tried earplugs but find them uncomfortable. Liz - that's good that it works for you, it just didn't for me. The Cheltenham Five: Part 1 where we eat CAKE!